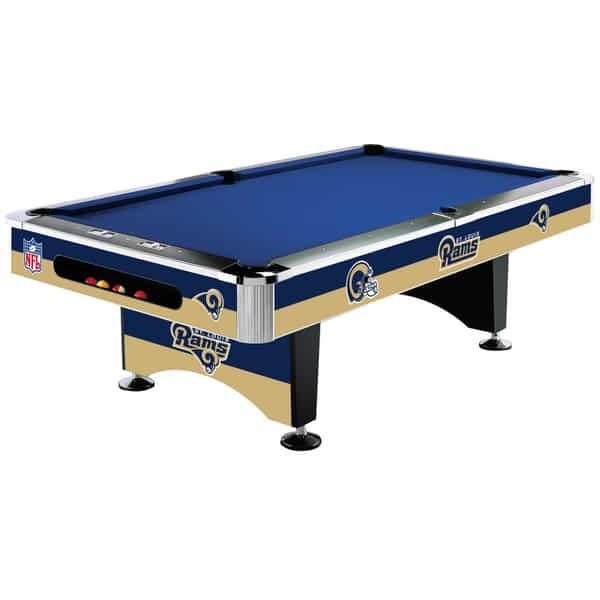 Revolutionize your game room or man cave like the Greatest Show on Turf revolutionized the NFL offense with the St. Louis Rams NFL Pool Table from Imperial Billiards and Family Leisure! Being the only pool table sanctioned by the National Football League, it offers the beautiful millennium blue, new century gold and white Rams colors, along with one of the most familiar logos in the NFL. And fellow fanatics will not only love the new centerpiece in your basement, but also the perfect playing experience. Metal beam frames and laminated cross supports hold traditional slate for the playing surface, which is cherished by professionals as the best material for providing a smooth game. And you can rely on the team of Imperial Billiards and Family Leisure. Imperial has been in the billiards industry since the 1930s, while Family Leisure offers the largest network of pool table installers in the nation along with free nationwide shipping that is hassle free.